First we went to the New Albanian Brewing Company (NABC). This local favorite always draws a crowd, known for great pizza with endless toppings and in-house craft beer. One side of the building is the NABC Pizzeria and the other side is the Public House. NABC is a great brewery for anyone seeking to expand their craft brew palate. Todd ordered the “Old Bob’s 15-B Porter” (RIGHT: American Porter ABV:5.5% IBU:35). This craft beer is a great entry-level option for new porter drinkers. The aroma was rich with roasted malt and hints of coffee and dark chocolate. The flavor was much the same with deep chocolate malt and roast flavors. I had “The Dunwich Porter” (LEFT: smoked porter ABV:7% IBU:34) , which had a similar profile to the ‘15-B’ but was more full-bodied. I could also appreciate the smoky aftertaste which left my taste buds craving a smoked brisket sandwich. The Red Room is an intimate space, surrounded by portraits of famous communist influencers such as Karl Marx, Vladimir Lenin, and Kim-Jong-il. NABC features in-house craft beers and rotating guest drafts. NABC has a great rec room space with pinball machines, a flat screen TV couch and arcade games. Around the corner from the general seating area, is a dimly lit lounge and bar space. The low-key lounge area feels like a speakeasy with couches and celebrity photos. Less than a half mile from NABC is Donum Dei (pronounced ‘Day’). You&apos;ll want to make sure you find this brew house since it is tucked in a strip mall behind El Nopal Mexican Restaurant off Grant Line Road. It&apos;s well worth the search. Every time I have visit, the staff is friendly and welcoming. Donum Dei is also family friendly with a light menu. On St. Patrick’s Day they made history by barreling the first-ever bourbon that was distilled and aged in New Albany. This makes them the first ‘brewstillery’ in the Kentuckiana region. Todd had the ‘ESB’ (LEFT: Extra Special Bitter, ABV:6.6%, IBU 14), a great balanced selection that was not as bitter or sweet as most ESB’s and more like an amber with strong fruity notes. I had the ‘Afterplex Belgian Double’ (RGHT: IABV:8.8%, IBU 19), a medium-full bodied brown ale with a flavor profile that offered smoky notes with hints of chocolate. Donum Dei also has an art gallery with featured acrylic paintings on display created by Lanesville resident Josh Bleecker. 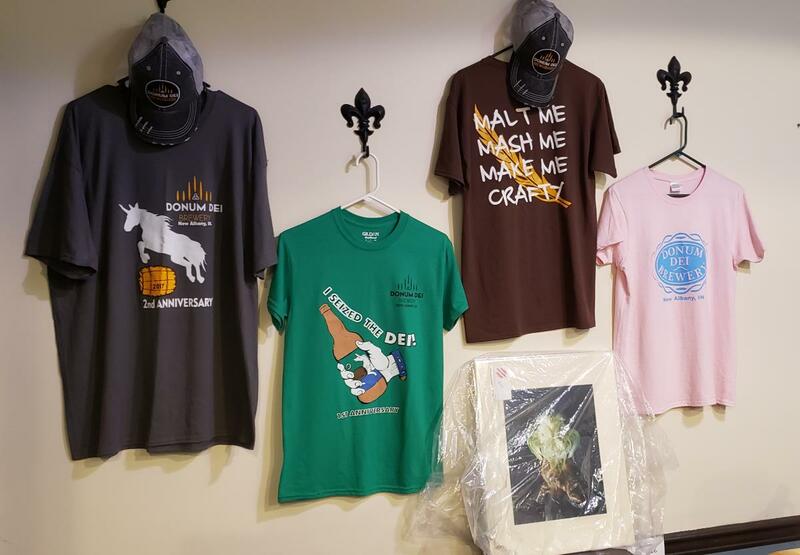 Donum Dei sales company branded t-shirts and in-house craft pints. Click the link to find more great breweries in SoIN!